Dlink is a multinational networking equipment manufacturing corporation. The Dlink 850L is a Wireless AC1200 Dual Band Gigabit "Cloud" Router. Mydlink Cloud Services allow you to access, view and control the devices on your home network from anywhere. The Dlink 850L is a router overall badly designed with a lot of vulnerabilities. Basically, everything was pwned, from the LAN to the WAN. Even the custom MyDlink cloud protocol was abused. My research in analyzing the security of Dlink 850L routers starts from a recent security contest organized by a security company. The Dlink 850L has 2 versions of these routers with very slight hardware modifications. The contest targeted the first version (revisionA) but I (unfortunately) received the wrong version, revisionB (thank you Amazon! ), which was not eligible for the contest. In this advisory, I would like to introduce the 0day vulnerabilities from both versions of Dlink 850L that were not submitted to the contest. Note that I submitted a valid vulnerability to SSD which was patched. Following a very badly coordinated previous disclosure with Dlink last February (see https://pierrekim.github.io/blog/2017-02-02-update-dlink-dwr-932b-lte-routers-vulnerabilities.html), Full-disclosure is applied this time. revA targets the revision A of the router with the latest firmware available (DIR850L_REVA_FW114WWb07_h2ab_beta1.bin). revB targets the revision B of the router with the latest firmware images available (DIR850LB1_FW207WWb05.bin and DIR850L_REVB_FW207WWb05_h1ke_beta1.bin from http://support.dlink.com/ProductInfo.aspx?m=DIR-850L, DIR850LB1 FW208WWb02.bin from http://support.dlink.com.au/Download/download.aspx?product=DIR-850L). The latest firmware for Dlink 850L revA (DIR850L_REVA_FW114WWb07_h2ab_beta1.bin) is not protected and a new firmware image can be trivially forged by an attacker. The latest firmware images for Dlink 850L revB (DIR850LB1_FW207WWb05.bin, DIR850L_REVB_FW207WWb05_h1ke_beta1.bin and DIR850LB1 FW208WWb02.bin) are password-protected with a hardcoded password. #define USAGE "Usage: decimg <filename> <key>\n"
0             0x0             DLOB firmware header, boot partition: "dev=/dev/mtdblock/1"
The protection of the firmware images is non-existent. 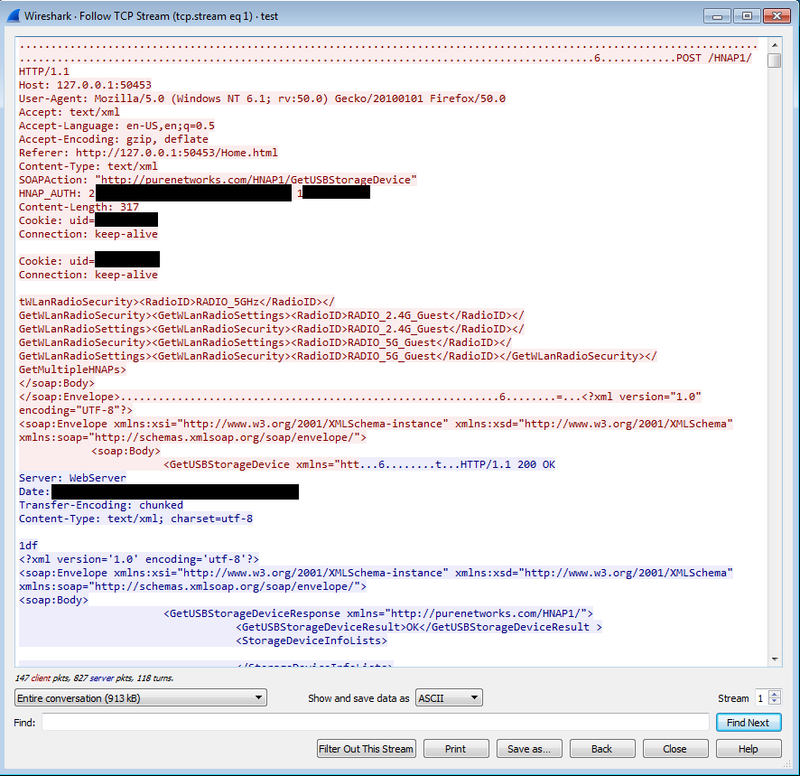 Simply by analyzing PHP files inside /htdocs/web, we can discover several trivial XSS. An attacker can use the XSS to target an authenticated user in order to steal the authentication cookies. The webpage http://ip_of_router/register_send.php doesn't check the authentication of the user, thus an attacker can abuse this webpage to gain control of the device. This webpage is used to register the device to the myDlink cloud infrastructure. add the device to this account (the device will pass admin password to the Cloud platform! Meaning the passwords are stored in cleartext). 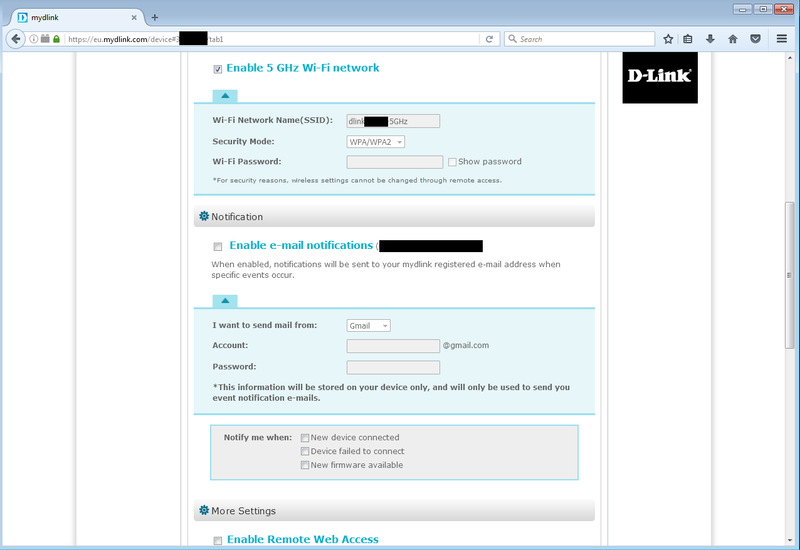 o The attacker will then visit Dlink mycloud webpage using a classic browser (i.e. : Firefox 50 and install the official Dlink NPAPI extension (this will not work with Firefox > 50 or any recent version of Chrome since this plugin requires unsandboxed NPAPI support). This webpage will allow the attacker to remotely control the device (reboot, general management...). 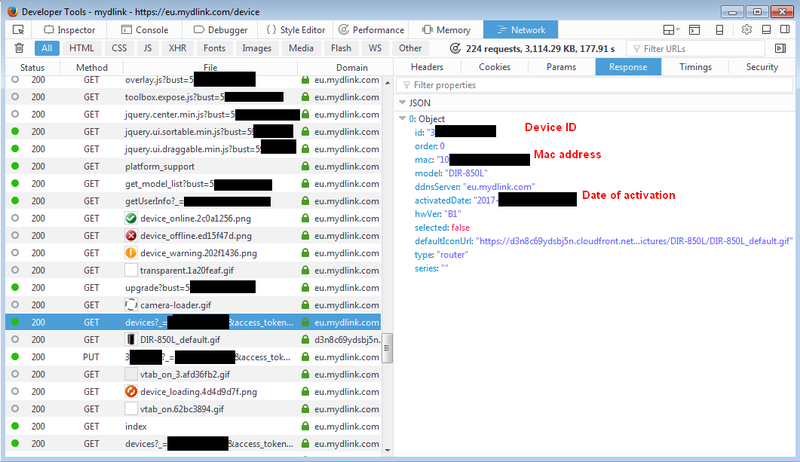 o Then, using Firefox dev tools, the attacker can passively analyze the default HTTP requests/responses from the Dlink APIs on www.mydlink.com: The dlink cloud interface will leak by default the password of the device (!) inside the answer of a PUT request (and inside GET requests too). Just by watching the HTTP requests from the NPAPI plugin, the APIs will provide passwords of the device in cleartext. Firefox NPAPI client (http://127.0.0.1:remote_port/)   ->    Amazon   ->    Dlink 850L HTTP Interface. o The attacker will use the previous password provided by the legit HTTPS answers from the Dlink APIs and will be able to login inside the router. At that point complete control over the router is achieved. o This is made possible by the signalc program (inside /mydlink/) that creates a TCP tunnel to Amazon servers. Finally, I will demonstrate some part of the traffic inside this tunnel is in cleartext and the other part (encrypted traffic) can be MITM'd thanks to self-signed certificates and the complete lack of certificate verification. The PHP script hosted at http://ip_of_router/register_send.php will serve as a proxy between the attacker and the remote Dlink APIs. This page will also retrieve the password (it is stored in cleartext - see part 8. Weak files permission and credentials stored in cleartext) and send it to remote Dlink APIs. 179 $post_str_signup = "client=wizard&wizard_version=" .$wizard_version. "&lang=" .$_POST["lang"]. 180                    "&action=sign-up&accept=accept&email=" .$_POST["outemail"]. "&password=" .$_POST["passwd"]. 188 $post_str_signin = "client=wizard&wizard_version=" .$wizard_version. "&lang=" .$_POST["lang"]. 196 $post_str_adddev = "client=wizard&wizard_version=" .$wizard_version. "&lang=" .$_POST["lang"]. 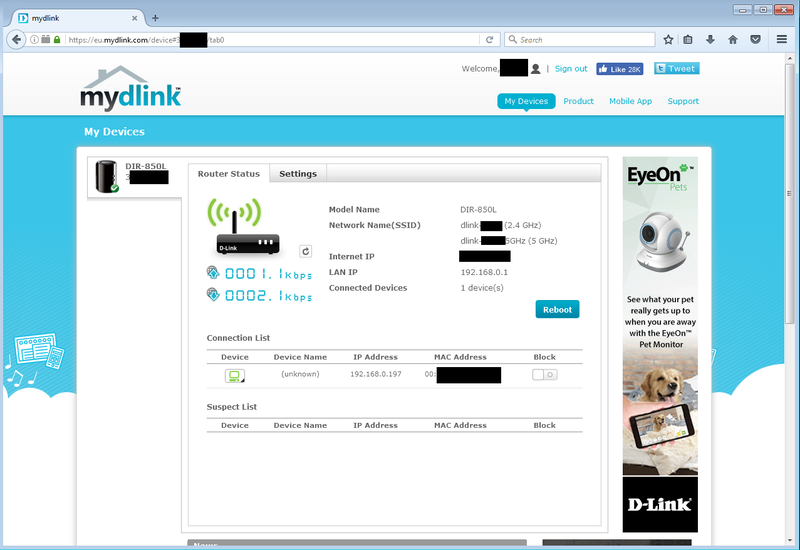 Then, visit http://mydlink.com/ and login using the email and the password. You will see the device listed in the web interface (You need to install the plugin - you can use "IE8 - Win7.ova" from Microsoft, you need Firefox 50 to use the plugin). 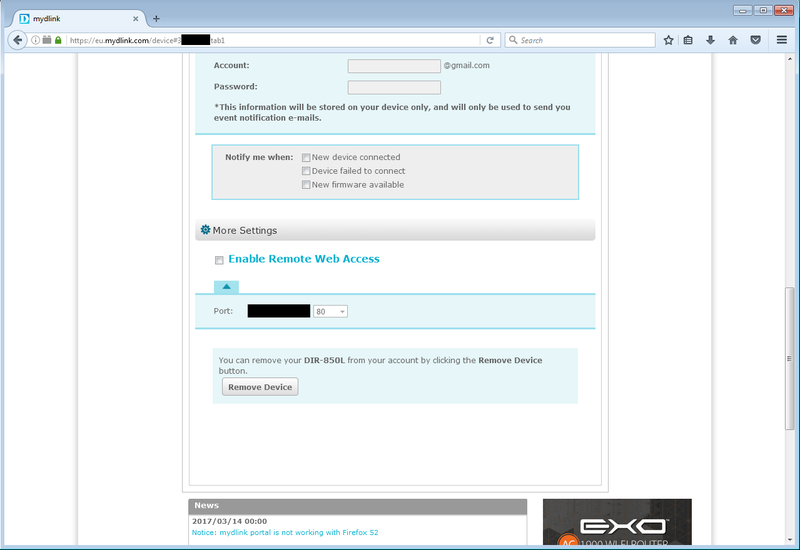 It appears the PUT (PUT IDENTIFIER_OF_THE_ROUTER) request provides a response with the cleartext password of the device! Note that there is a GET request on the end of the image, we will study it too. Ok, let's browse http://127.0.0.1:50453/. The traffic is sent to the remote router over the Cloud protocol. These vulnerabilities may affect some Dlink NAS/routers/cameras. On a side note, it is interesting to find that DLink is storing all the passwords of devices using the mydlink service in cleartext. the other one with the HTTPS server of the dlink router as an endpoint. So, it appears, the router is reachable over this TCP tunnel using either HTTP and HTTPS. By default, you can see HTTP request AND HTTPS request from the browser (over the tunnel) to the router. About the HTTPS requests, the SSL certificate provided by the router is self-signed. Sus, an invalid certificate can be forged and used in order to successful MITM the device and intercept information. More, by default, a TCP relay for HTTP is made by the NPAPI plugin to the router as shown above. 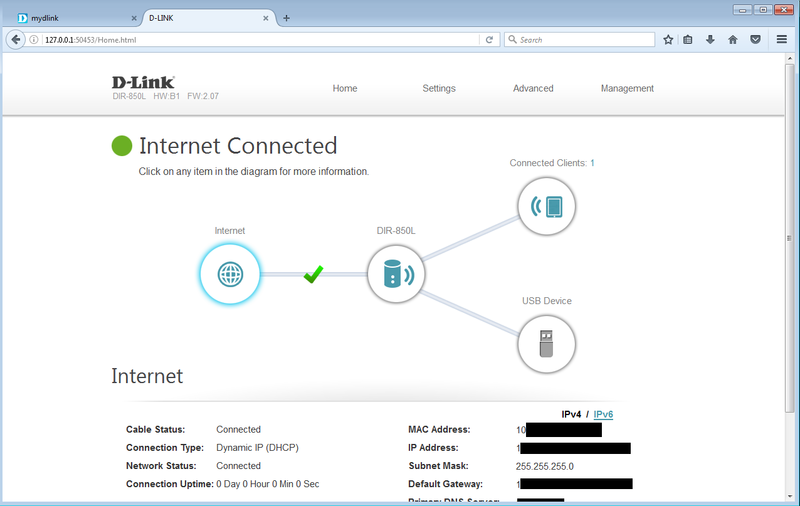 Futhermore, the /mydlink/signalc program running inside the router uses the MAC address of the device to get an unique identifier, which will always be the same, even if the dlink device is reset or linked with a new dlink cloud account. 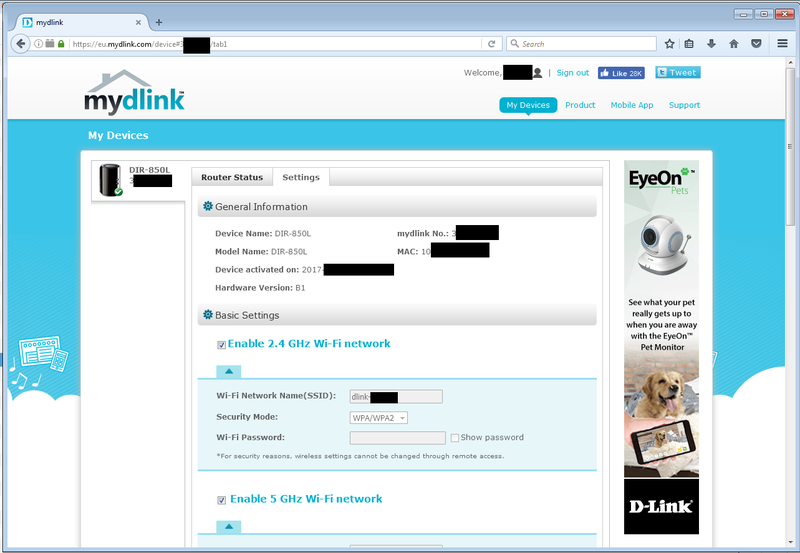 This allows Dlink to 'follow' the ownership of the device. This program will only rewrite information over /dev/mtdblock/4. Finally, the mydlink interface allows the user to enter credentials for gmail/hotmail accounts, the credentials are then transfered to the routers using the tunnel established with the cloud protocol. It doesn't seem to be a good idea, as the traffic between the router and the Cloud platform is not encrypted or encrypted using a self-signed certificate without verification and the passwords are sent over this tunnel using the Internet. These vulnerabilities may affect some Dlink NAS/routers/cameras (every device that supports the MyDlink cloud protocol). mfcd is in fact a telnetd server. the -u flag defines the authorized user with the associated password ($image_sign variable). br0 is a bridge for these interfaces: eth0, peth0, wlan0 et wlan1. This backdoor access can be only used from the LAN side. The file htdocs/parentalcontrols/bind.php allows to change DNS configuration. It doesn't check authentication of the admin user. An attacker can use this vuln to forward traffic to server he/she controls (i.e. : custom Dlink Cloud servers, to take control over the dlink router). /var/passwd contains credentials in cleartext. This file contains a DES hash of the admin user. /var/run/storage_account_root contains credentials in cleartext. The files /var/run/hostapd* contain the wireless passphrase in cleartext. The DHCP client running on the router is vulnerable to several command injections as root. Wrote 1 leases to leases file. 10.254.239.10 - - [03/Jul/2017:15:40:30 +0000] "GET /dhcp-rce HTTP/1.1" 200 383 "-" "Wget"
10.254.239.10 - - [03/Jul/2017:15:40:30 +0000] "GET /dlink-telnetd HTTP/1.1" 200 10520 "-" "Wget"
drwxr-xr-x   16 root     root          241 Jan 20  2017 ..
drwxr-xr-x   14 root     root            0 Jan  1 00:00 . This telnetd access is reachable from the WAN and the LAN. And you have command injections everywhere starting line 101. 101                 'echo [$0]: $1 $interface $ip $subnet $router $lease $domain $scope $winstype $wins $sixrd_prefix $sixrd_prefixlen $sixrd_msklen $sixrd_bripaddr ... > /dev/console\n'. As you can see, variables are not sanitized. One solution is also to inject commands using the /var/servd/$VAR-udhcpc.sh script with $domain (option domain-name in isc-dhcp). phpsh /etc/services/INET/inet4_dhcpc_helper.php ACTION=$1 INF=WAN-1 INET=INET-3 MTU=1500 INTERFACE=$interface IP=$ip SUBNET=$subnet BROADCAST=$broadcast LEASE=$lease "DOMAIN=$domain" "ROUTER=$router" "DNS=$dns" "CLSSTROUT=$clsstrout" "MSCLSSTROUT=$msclsstrout" "SSTROUT=$sstrout" "SCOPE=$scope" "WINSTYPE=$winstype" "WINS=$wins" "SIXRDPFX=$sixrd_prefix" "SIXRDPLEN=$sixrd_prefixlen" "SIXRDMSKLEN=$sixrd_msklen" "SIXRDBRIP=$sixrd_bripaddr" "SDEST=$sdest" "SSUBNET=$ssubnet" "SROUTER=$srouter"
10.254.239.10 - - [03/Jul/2017:15:42:31 +0000] "GET /dhcp-rce HTTP/1.1" 200 383 "-" "Wget"
10.254.239.10 - - [03/Jul/2017:15:42:31 +0000] "GET /dlink-telnetd HTTP/1.1" 200 10520 "-" "Wget"
event UPDATELEASES.LAN-1 add "@/etc/events/UPDATELEASES.sh LAN-1 /var/servd/LAN-1-udhcpd.lease"
event UPDATELEASES.LAN-2 add "@/etc/events/UPDATELEASES.sh LAN-2 /var/servd/LAN-2-udhcpd.lease"
It appears some daemons running in the routers (revA and revB) can be crashed remotely from the LAN. As it doesn't provide further remote privileges to an attacker, this is only for information and was not detailed. Due to difficulties in previous exchange with Dlink, Full-disclosure is applied. Their previous lack of consideration about security made me publish this research without coordinated disclosure. I advise to IMMEDIATELY DISCONNECT vulnerable routers from the Internet. Jun 15, 2017: Vulnerabilities found. Jul 03, 2017: This advisory is written. Sep 08, 2017: A public advisory is sent to security mailing lists. Sep 13, 2017: MITRE provides CVE-2017-14413, CVE-2017-14414, CVE-2017-14415, CVE-2017-14416, CVE-2017-14417, CVE-2017-14418, CVE-2017-14419, CVE-2017-14420, CVE-2017-14421, CVE-2017-14422, CVE-2017-14423, CVE-2017-14424, CVE-2017-14425, CVE-2017-14426, CVE-2017-14427, CVE-2017-14428, CVE-2017-14429, CVE-2017-14430. These vulnerabilities were found by Pierre Kim (@PierreKimSec). Big thanks to Alexandre Torres.